Our Neck of the Woods: Fresh Eggs Daily Book Review AND Giveaway! 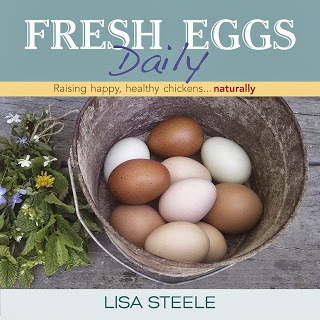 If you follow any chicken themed blogs, chances are you've heard of and visited Fresh Eggs Daily written by Lisa Steele. Lisa focuses her posts on natural methods to keep your chickens healthy and happy, and has become quite the expert on the topic. So much so, that she wrote a book about it! I was thrilled to receive a copy of Lisa's book to review and I am so excited to tell you about it. Just as the title suggests, the book is about raising happy, healthy chickens naturally. In her years of keeping chickens, Lisa has discovered that herbs, greens, and flowers play a very important role in maintaining chickens' health. Over the past several years, I have been more interested in preventive care and treatment for myself using natural remedies like herbs, so it only makes sense that I would extend this to my chickens as well! Fresh Eggs Daily is very well written and easy to read, with loads of beautiful photos that Lisa took herself. The book is organized to take you through how to use herbs in your chicken coop (I can't wait to try out the lavender mint coop refresh spray!) and also how to feed herbs to your chickens. Lisa guides you through the summer and winter months to show how to be sure your chickens stay healthy with the changing weather. I appreciated the section in the appendix with a long list of the health benefits of common herbs, weeds, and flowers. One list is organized by plant name, and another list is organized by the benefit provided. This way I know exactly what to reach for when I notice a specific problem. So handy! I believe this book is essential for any chicken keeper. Like the old saying goes - an ounce of prevention is worth a pound of cure. If you can head off potential sickness in your flock using common herbs and greens, why not give it a shot? It's much better than treating with harsh medications after a problem creeps up. I would encourage all the chicken keepers out there to get their own copy of Lisa's book right now! You can purchase the book on Amazon by clicking here. Lisa has also generously provided a copy of her book for one of my readers. For your chance to win a free copy of Fresh Eggs Daily, enter using the widget below. Good luck! In addition to my giveaway, many other bloggers are participating in a virtual book tour with more chances for you to win a copy of the book. Visit all the other stops along the Fresh Eggs Daily Blog Tour to read some more great reviews and to enter to win a copy! Disclaimer: I received a copy of Fresh Eggs Daily for review. No other compensation was received and all opinions stated are my own. Thanks for the wonderful review. It sounds like an awesome book! I am a newbie owner of 7 LF, 3 Bantam, & 6 Serama chickens. I need all the help I can get to keep them happy & healthy & this book sounds like just the one I need. I would love the book, because I love books and chickens! We have been raising chickens for eggs and meat for several years, but I am always mystified by something or other. It sounds like a great book. I would love to read Lisa's book because there is so much to learn about raising chickens! I would love to have a copy of this book as a reference for my chicken raising. We are new to raising chickens. My husband brought home 6 chicks in the spring. 1 is a rooster, the other 5 have been providing us with wonderful, delicious eggs for a few months now. I never tasted better eggs than the ones we get from our own chickens. Would love to win a copy of the book to find our more info. Sounds like a great book - love the pictures. I love the look of this book and the natural approach to caring for chickens! I have had chickens for two months now and I really enjoy them. Your blog has been such an inspiration! We are planning to get chickens next Spring, so this book would be perfect to get us started with everything we need to know :) Thank you for a chance to win! Tammy, I won't enter and give my chance to someone who has chickens and could use it -- but it does sound like an excellent book to use for a resource!! My question is--- if you feed your chickens mint - will your eggs have a mint flavor? I remember my Granddad saying that he had to keep the garlic out of the cow field because it would ruin the milk if the cows grazed on it. I would love to have this book, because Lisa's blog is one of my favorite websites. I want to raise my chickens as naturally as possible and this would be an awesome addition to the website. I love her blog and would love to get a copy of her book. I hope to try out her recipe for herbs in the nesting box. Prevention is key! This book would be amazing... my husband is finishing up our coop this weekend and we just swung by the local store to take a gander at the chicks this afternoon. Barely resisted bringing some home with us, but we're just not ready yet! This would be a good addition in my chicken library! It looks like an interesting book with wonderful pictures taken by Lisa. I won't enter the giveaway as I don't raise chicken and there are many of your followers who raise chickens that would love to win it. I'd love to read this book because her idea for healthy chicken care is breath of fresh air. I need ideas to move away from the traditional medicated, unhealthy way to care for my girls. I love Lisa's blog and would love to win this. We love our girls and I'd love this book to help me take good car of them and thank them for the wonderful eggs they give us! I would love to read this book to utilize a more natural approach. We already do everything organically without any chemicals but as a reference and source of new information, it would be awesome. Loved the post though I do not have roosters...:D Will stalk you without any fail. I want to learn more natural ways to take care of my chickens. This looks like a great book. I am going to have to get it for my sister. I pretty sure they have at least 35 chickens if not more. I am thrilled to find so many great resources. My fiance and I are saving to buy a little self-sustaining organic farm in the countryside somewhere. Winning this book would help us continue our research. There is so much to learn in this world and chicken is where Ive focused my energy lately. I'd love to add this book to my library to help further our coop.